Perhaps if ornithology had not become my living, I might have taken things a little further with music. I was fortunate to grow up in a music-rich environment, my father being an all-rounder on brass, woodwind and percussion insruments as a result of his position as a bandmaster in the army. Logically I suppose I should have ended up playing something in his repertoire but inspiration came a little later in my case and it was on the school bus where I watched in admiration a fellow pupil knocking out a very respectable rendition of 'House of the Rising Sun' - not on a trumpet but on a guitar. I was hooked and had to play. The first complication was to get hold of an instrument. This turned out to be not so difficult as my brother had recently bought a nylon-strung guitar which he was starting to learn. However, it soon became apparent that his interest had dwindled and the guitar sat unplayed, gathering dust in his room. This was my opportunity and when no-one was around I would quietly borrow it and start to work out the first chords and the first tunes. It was a clandestine affair and to ensure nobody smelt a rat the dust was 're-created' on the the guitar at the end of each session. This went on for some time and whether he suspected something or whether he was just hard-up I don't know but I was invited to buy it. This was too good an opportunity and I blew what pocket-money savings I had without hesitation. So, there it was...officially mine and I gazed at it in admiration. However, one thing wasn't quite right. The rendition of 'House of the Rising Sun' on the school bus sounded different than my own. I recalled a nice 'pingy' quality to the notes which could only arise from steel strings. Simple, I thought and went straight to the music shop and bought a set. In no time they were fitted in place of the nylon strings and I was ready to go. 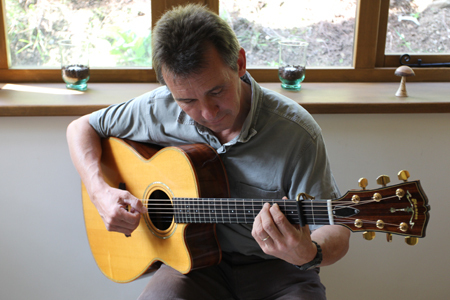 I had of course unwittingly ignored one rather important point - the guitar I had was designed for nylon strings and not for the much higher stresses imposed by steel. Over the following days and weeks I couldn't help noticing that it was becoming more difficult to play which I first attributed to the new strings. However a casual glance along the neck would tell the full story - it was warping nicely with the strings rising above the fretboard by milimeters each day. I had destroyed it. Guitar-less once again but now with an unstoppable determination to play, it was not long before a new instrument came my way and from my farm-job wages I was able now to get the real thing - a proper steel-strung guitar which looked like the kind of thing being played by all the greats like Paul Simon, Don McLean and Ralph McTell.My beloved guitar went everywhere with me and at university I encountered lots of great players who provided further inspiration. I was still working out such pieces as Classical Gas and the great Paul Simon version of Davy Graham's 'Anji' when I was invited to go to a local folk club to see John Renbourn and Jaqui McShee. All I knew was that they were members of the cult band Pentangle which had disbanded recently. It was an evening that will live with me forever. The MC announced that Jacqui’s train was delayed and John would open the evening. Onto the stage he walked, no glitz, no show, jeans and boots. A stunningly beautiful Guild D50 guitar emerged from a case and just the process of tuning was, in itself, riveting with multiple harmonics ringing out. I knew straight away this was going to be good. What followed was an astonishing display of guitar mastery – a fusion between early music with tinges of jazz and blues thrown in. Everything was perfect, the right hand adopting a classical position while the left hand danced around effortlessly all over the fret board, dextrous manoeuvres on the upper strings complemented with rich harmonies in the bass. I was stunned. Never had I seen anything so good and as the evening unfolded Jacqui’s perfect renditions of folk and blues numbers were against the backdrop of John's accompaniments, weaving intricate patterns but never over-shadowing her. It was total synergy - a lesson to all would-be guitar players and a complete inspiration for my own playing. The months that followed found me scouring the record shops for recordings of John and Pentangle and then the music shops to find any notation of his pieces. Having found them this then set me up for years to follow and my determination to play them was I suppose the best training I could have. The opportunity to play in a group arose when I met local musician John Neilson and together with ace vocalist Annette Batty we formed Manticore. What followed were several years of touring around, playing at a variety of venues. They were good times and I guess we all developed. Eventually, I started to do some of my own guitar arrangements and then some original compositions. Much of this was spurred on by good friend and fine photographer Ben Osborne who used a piece of mine as the theme for his photographic journey to Antarctica call 'Life in the Freezer'. To my surprise, it seemed to appeal to those listening and it was not long before there were requests for it to be recorded. 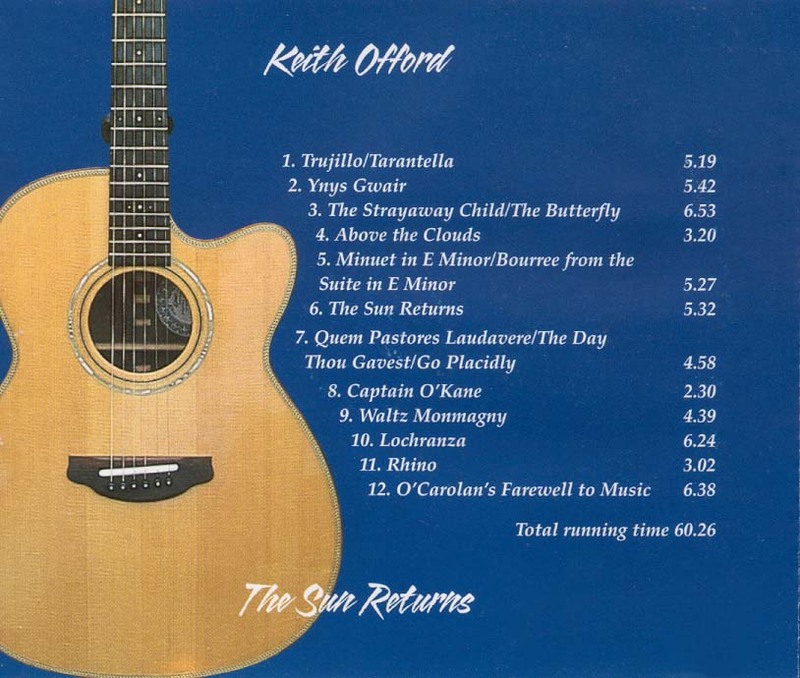 This led to a rather longer project where, along with this particular piece, I added 11 other tracks, comprising a big mix of traditional Irish, classical, hymn tunes, blues and some more original pieces. 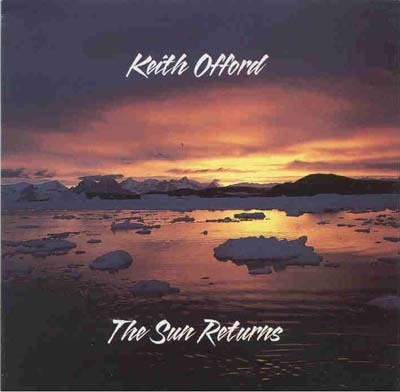 It was produced under the title 'The Sun Returns' and alongside my guitar I was ably assisted by John Neilson and Irish all-rounder Drew Hurley.